I just returned home from 4 glorious days in beautiful and tranquil Anguilla. The island is super laid back and the beaches scream for you to just come and veg out on their white sands. Believe me, I did exactly that every chance I got, but I was also taken around by locals this time who showed me another side of Anguilla. I met up with Samantha and Vanessa, two island girls who call the island of Anguilla home. We met on Instagram. Now, who says social media doesn’t make you social? These girls were most accommodating, picking me up from my hotel, eager to show me places I have never seen before and experience a different side of their island. People from St. Maarten or the “City Island” as we are called sometimes, have this misplaced notion that Anguilla is a quiet, boring and backwards little island where nothing other than beach, sleep and repeat happens. I can now tell you that this is the biggest load of bull crap I have ever heard. Anguilla is what St. Maarten used to be about 20 years ago and unlike St. Maarten it has found a way to maintain it’s Caribbean charm. With colorful little houses alongside the roads, cows and goats grazing in nearby fields, amazing restaurants, food shacks and unspoiled beaches, this British isle lacks absolutely nothing and after the hustle and bustle of the “City Island”, it is an inviting change. I am a fan of the regular ferry leaving from Marigot, French St. Martin. That is until I discovered the Anguilla Ferry Terminal by the airport on Dutch St. Maarten, from where about three independent fast-ferry companies operate. For this trip I chose GB Ferries. What a complete different experience. From check in to arrival, it was one smooth ride. And unbeknownst to me, GB fast ferry was actually much faster. Imagine that! We got there in under 22 minutes and the service on board was impeccable. I felt like royalty. Thank you GB Ferries. A round trip will set you back a bit more than a roundtrip with the public ferry but it is worth every single dollar. Anguilla has a long list of restaurants, from very posh to super laid back. I suggest you to sample around. For me 4 days was just not near long enough to sample everything. A good excuse to re-visit, don’t you think? After a bit of a disastrous first experience at Scilly Cay, a tiny dot of an island in Island Harbour (and I had such high hopes for this one), Falcon’s Nest was a welcome change. It’s a cute shack on the beach of Island Harbour. I fell in love with their fish bits and their own special sauce called the Falcon Dip was just to die for. Their rum punch was on point and the service friendly. The Beach Shack, how the locals call it has long been a favorite of mine. With its cute blue picnic tables in the sand looking out onto gorgeous Meads Bay there really is no way to go wrong here. Their menu is quite extensive so I’m sure finding the right snack, dessert or drink will not be a problem. Try their margaritas and chicken tacos. Yummm. Do I really have to say again how much I love their fish and polenta and special home made hot sauce? Just go and experience it for yourself. Don’t expect to be very lucid after the heavy meal at Johnno’s though. You will definitely need a nap on the beach after all that good food. Visit on Sundays for lunch with live music and a great local ambience. Johnno’s is located on the Sandy Ground Beach. This little beach shack might not look it but it is a culinary gem and every bite was a delight. I was invited to dine here with local friends and I was blown away by the taste of the food and the punch of the drinks. A fantastic time was had by all and a return visit to this restaurant located on Shoal Bay beach is already in the plans. Try their escargot and Mahi skewer. UPDATE: The original Madeariman burnt down just before the start of the 2016 Caribbean season but was quickly rebuilt and reopened just a few months after. For a great breakfast or afternoon high tea complete with cucumber sandwiches head over to Valley Bistro in the Valley. I am usually the one to skip breakfast. I know. I know, breakfast is the most important meal of the day and I promise to start taking better care of myself. If the Valley Bistro’s cheese omelettes with guacamole on the side is what is on the menu every morning, skipping breakfast will be a thing of the past. I’ve always known that Anguilla takes their sailing very seriously but now having experienced Anguilla Day on May 30th first hand, I can tell you that it is definitely considered the national sport. The Anguilla Day Round the Island Race is by far the largest sailing event every year. For those who missed booking a spot on one of the many spectator boats there is little else to do but follow the race from land. I’m talking about hopping on and off the car at every spot on land that allows you to see the boats pass by until reaching the end destination on Sandy Ground. I’ve always applauded this little island for not having any traffic but try getting in or out of Sandy Ground as the last boats arrive on Anguilla Day. Gridlock! When Vanessa, my new Anguilla friend took me to Maunday’s Bay to meet her dad and his two horses I was not prepared for the gorgeous scene that greeted me. This beach is one of the most beautiful I have seen on Anguilla and riding on horseback in this clear water was a true treat. Zambezi, the owner and his horse Juluca took great care of me, a first time horseback rider. It is an experience I will recommend to anyone. True animal friend that I am I found that Zambezi’s horses Juluca and Tosh were well taken care of and the love between horses and man was not hard to miss. I spent my last full day in paradise vegging out at Da’Vida Bayside, a popular restaurant located on Crocus Bay. While the food was not exactly to write home about, the Johnny Cakes with cheese, the margaritas made from scratch and our waiter Ramon were “fantabulous”. So after a bit of relaxation we rented some snorkeling equipment from the water-sport hut onsite and went into the water. All I can say is that I was not prepared for such beauty. I will leave the pictures speak for themselves. Nothing screams luxury more than the Viceroy Resort so when my Anguilla girls picked me up for drinks at the resort’s famous Sunset Lounge I made sure to put on my best ensemble and look the part. Of course I failed miserably since I packed only beachwear. A trip to Anguilla is just not complete without a stop at this popular happy hour hangout. It’s chic, the view incredible, the music swaying and the drinks: OMG. Don’t miss their signature drink, the Jalapeño Margarita. Ayayay! It makes you sing like a Mexican. UPDATE: This Viceroy resort has since been taken over by the Four Seasons. Elvis is a boat bar at the end of the Sandy Ground beach well known for its mamahouana shots. But it is also a great place to relax, see the sun set, enjoy great music and strike up conversations with random strangers. The place is especially happening on Sunday afternoons. Who would say no to a massage on the beach? Exactly. No one. I am no exception and I thoroughly enjoyed a relaxing Swedish massage by the more than capable Simone from Malakh Spa. I swear this woman has magic hands, and with the soothing sounds of the waves from nearby Shoal Bay beach and the gentle breeze smelling of salty goodness I completely lost track of time as all the stress left my body. Sorry about the drool on the pillow. I will definitely be back. I’m not exactly feeling the name but I definitely felt the taste. This little hut sells the best there is in fresh island fruits. Choose from a smoothie made out of three different fruits, add the type of liquid you want (water, coconut milk, Soy milk, or regular milk) and a super food like Flack seeds: the result is a delicious island smoothie. 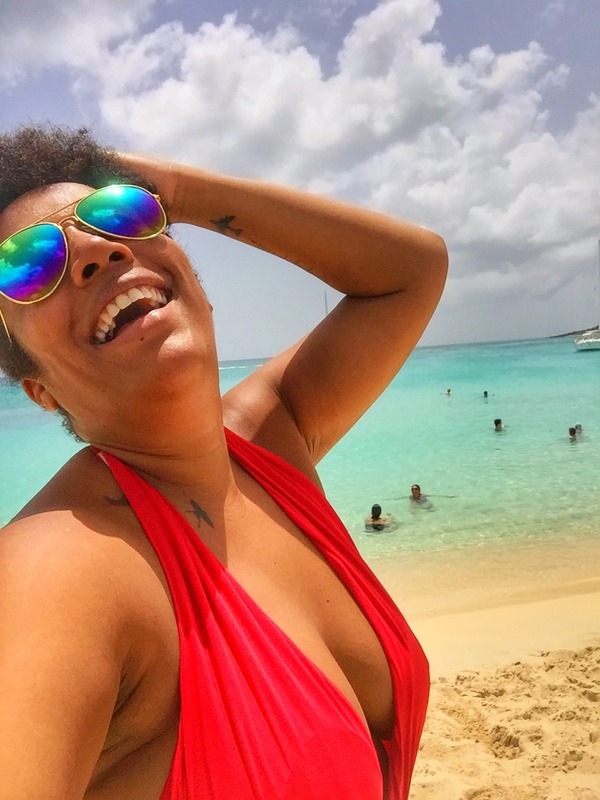 Anguilla is surrounded by gorgeous beaches and it is hard to pick one as an absolute favorite so here is a list of the beaches I highly recommend you visit. I must confess that this particular trip to Anguilla was on the invitation of the Fountain Resort Residences. I did little research before heading out to see it for myself as I wanted to be completely unprepared and really allow myself to experience it first hand without any pre notion. The locally owned Fountain Resort did not disappoint. I had a nicely furnished one bedroom apartment with a complete kitchen, large flat screen tv in the living room and second tv in the nicely decorated bedroom. The large balcony was a perfect place to chill and relax after a day of sightseeing. Mine overlooked the pool and allowed me to view spectacular sunsets over shoal bay below. Look out for a complete review of this resort in the next few days but in the meantime take it from me, The Fountain Resort is the place to stay and I’m not saying that just because I was sponsored by the resort. Here are some pictures in case you don’t believe me and do stay tuned for a full review of this property. A very big THANK YOU goes out to Cassandra, Vanessa, Samantha, Daryl, Kebrina, Bevington and Aaron who all made this particular Anguilla trip one of the most fun, pleasant and damn straight fantabulous of all Anguilla trips so far. I have previously only visited Anguilla on day trips, which never allowed me to experience the true beauty of the island. I am happy to report that this particular trip deserves two thumbs up. Until next time, gorgeous Anguilla. Stay beautiful. What should I experience on my next Anguilla trip? Comment below. It’s always great to get some feedback. Is your brand or product interested in working with me? It’s easy. Just contact me and let’s start discussions. We are headed to Anguilla in May. Love the beach horseback riding you did with Zambezi. Do you know how I can reach out to him to get options and pricing? Was so great having you in Anguilla had blast with you guys cooked a storm much love. Not long home to the UK from our holiday to Anguilla and missing it badly, so lovely to see and read about places we enjoyed so much too. However, Anguilla should not be visited without an afternoon or sunset sail – we had an amazing afternoon visiting little bay through tradition sailing charters. Amazing people sailing an amazing boat. Don’t miss out on jumping off the side of the boat for a snorkel, or off ‘little rock’ to get your adrenaline pumping…. Thanks Jennifer. I will most definitely add this to the to do list for the next trip. Hey Jack, I was definitely on Shoal Bay East but want to see Shoal Bay West next time. I went to Moonsplash last year but didn’t make it to the Dunes this trip. I just can’t get enough of Johnno’s. Such great fish. Pay a visit to the Anchor Miniature Golf in Island Harbour and the Heritage Collection Museum in East End. Thanks Ernie, will definitely try these next trip. I am glad you enjoyed yourself and that you will come back again. Bring some friends with you and show them through your eyes what you love about our little island. Would love to. Send me an email with your info and we will plan something for my next AXA trip. I have not been to Anguilla for a few years but on the last couple trips we would spend a week in a villa in Blowing Point then a week in SXM. We LOVE Anguilla!!!!!! Our favorite beach is Little Bay hands down. To get there you need to take a boat from Crocus Bay. The beach is about 100 feet long surrounded by cliffs, the water is flat calm and you will likely have the beach to yourself. On our last trip we had the housekeeper prepare us dinner. When she asked what we would like we told her that we would like whatever her family would make for Sunday dinner. The meal was simple creole chicken with rice and peas and was fabulous. We sat down with her until late in the evening and talked about island life and what it is like to grow up on the island. OMG what a great suggestion. And yes, highlight was definitely sitting under a tree and talking to the locals. Even for me, an island girl. We were also on Anguilla for the around the island boat race. We were sitting on Shoal Bay and saw the commotion with all the boats. We decided to follow the race around the island trying to keep one step ahead of the race. We hopped and skipped around the island for most of the day. Every beach we went to had tons of families picnicking with kids running all over having a great outing. At one point at the far end of the island we were following a line of cars and we ended up on a single lane dirt road. (There had to be 100 cars) The road ended in an open field and turned into a real party. There had to be a couple hundred people on the rocks overlooking the point and we were the only non-locals. As the boats came around the point everyone was cheering for their favorite boat. I called it the Nascar of the Caribbean. We all had a great time cheering on our favorite boats with a bunch of new found friends. How fun. Definitely visiting o Anguilla Day again next year.